Weekends are magical in their own right. Without the responsibilities of work or studies, they have a much more relaxed pace. Weekday mornings, I rely heavily on the pre-programmed setting on my coffee pot and eat overnight oatmeal that I make the night (or multiple nights) before. Simplicity is key when time is of the essence, but on weekends, I take the time to grind coffee beans and actually cook breakfast! That said, I still don’t always have tons of patience in the morning before coffee. Having a quicker cooking breakfast that still makes me feel indulgent can really start my weekend morning on the right foot! Between salads and bowls, having extra cooked grain around is as simple as putting aside some leftovers or making an extra cup with a recipe. Quinoa is especially good for this, since it keeps its texture incredibly well leftover, and will keep for about a week! Morning porridge started become a regular occurrence when I realized I could use leftovers and make a really fancy-sounding breakfast without much effort and just one skillet! Maybe porridge doesn’t sound as awesome to anyone else, but, to me, it sounds like one of those wonderful things your grandma would have made for you if she hadn’t been turned to stone. The name alone gives the feeling of comfort food, and something hearty and filling- which this recipe totally is! It’s just a total bonus that it’s flavored like pie and delicious! Melt coconut oil in skillet over medium heat (this won’t take long at all), then saute apple in the oil, until starting to soften- about 5 minutes. Add cinnamon, salt, and maple, and stir to combine. Once apples are coated evenly in cinnamon, stir in the quinoa and almond milk. Simmer, stirring occasionally for another 5 minutes. The porridge will thicken somewhat during this step, so if it’s looking thicker than you’d like, add more almond milk! 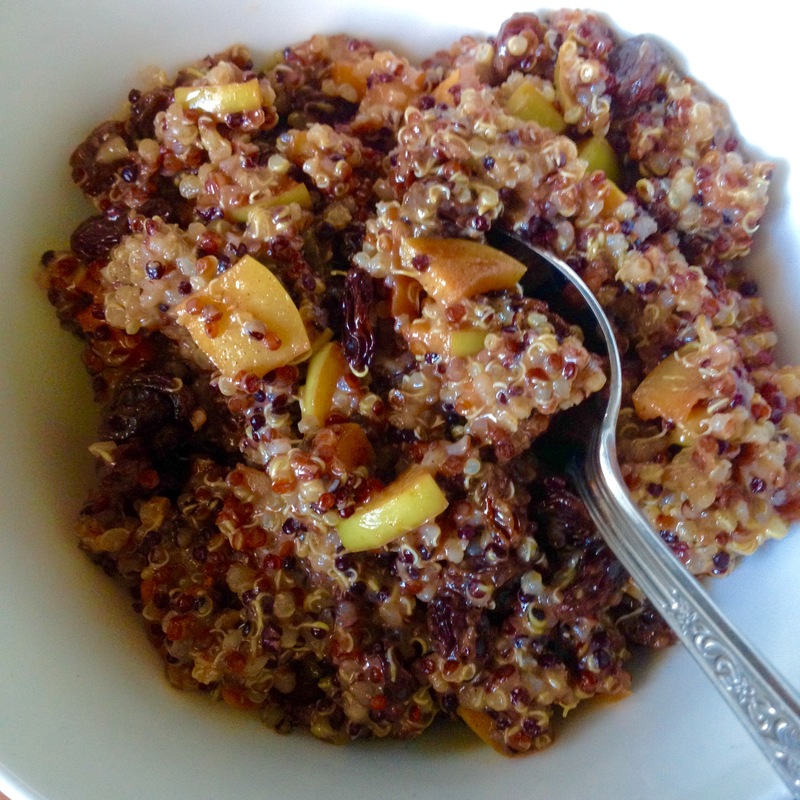 Stir in raisins, and serve hot! If you’d like a bit more crunch, try some chopped nuts on top! This entry was posted in comfort food, Magic Upgrade, powerful & potent and tagged brunch, comfort food, DIY, healthy. Bookmark the permalink.